On Tuesday I told you all that I bought some fancy local cheese and made a great burger – well I still had a lot left, so I was brainstorming things to make. I remembered something I read by Martha Stewart that suggested using sharp, pungent cheese when making macaroni and cheese because, not only does it add some more pizazz and a grown-up twist, you also apparently fill up faster and so eat less (for a mac & cheese-aholic like me, this is great news). But I couldn’t just do mac & cheese either. I decided to try to recreate my favorite thing on the menu from my old haunt in Pittsburgh, PA – Rock Bottom Brewery‘s mac & chicken. I’m happy to report the result was pretty awesome. 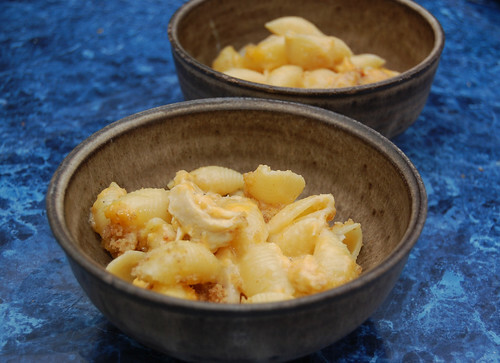 I adapted a great mac & cheese recipe from Alton Brown. If you use your time wisely and do a few things at once (e.g. start boiling the water for pasta once the chicken is halfway done) you’ll find that it doesn’t take you that long. 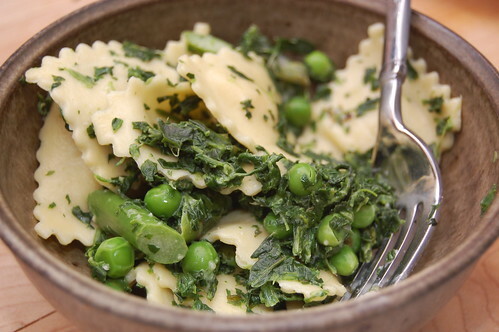 This is something great to make early in the week or on Sunday night and have it last for several days. Preheat oven to 425F. Trim the fat from your chicken and cut in half longways. Set on a baking sheet and season generously with paprika, salt, pepper and a little Montreal Chicken Seasoning. Bake for 20 minutes. To make the best use of your time, as soon as you put the chicken in the oven dice the onion, shred the cheese and measure out your ingredients. When chicken is halfway done, set a large pot of water to boil for the pasta and add pasta once it’s boiling. While you’re heating up the water and the chicken is still in the oven, set a medium size pot on the stove and melt the butter. 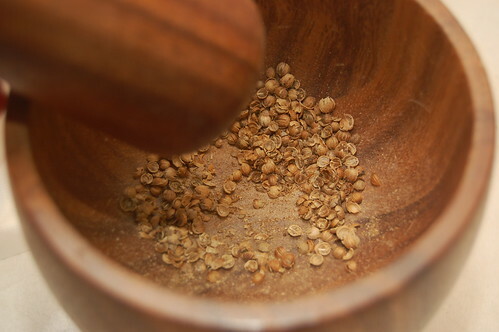 Whisk in flour and mustard powder – keep the mixture moving. When it’s lump-free, stir in milk, onion and paprika. Stir frequently for about 5 minutes. The chicken should be done by now, so set it aside to cool and turn down oven to 350F. Temper the egg slowly, then stir in 3/4 of the cheese. 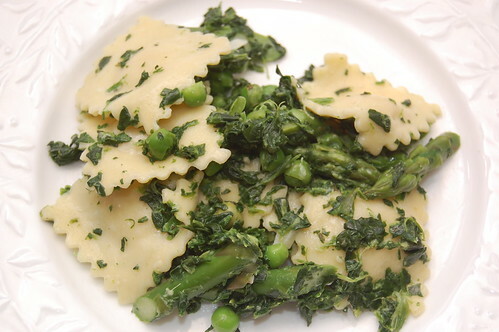 Season with salt and pepper, then fold the cooked pasta into the mixture. 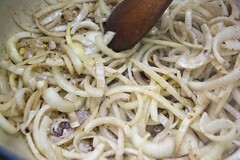 Shred cooked chicken or cut it into small pieces and incorporate with the pasta and mixture. 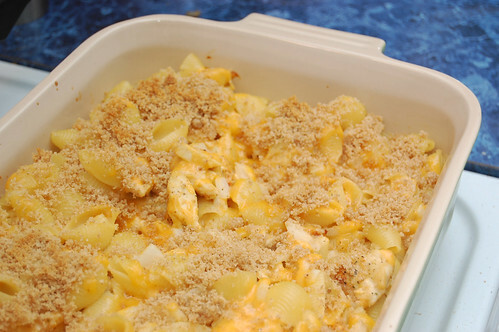 Pour into a large casserole dish and top with remaining cheese. 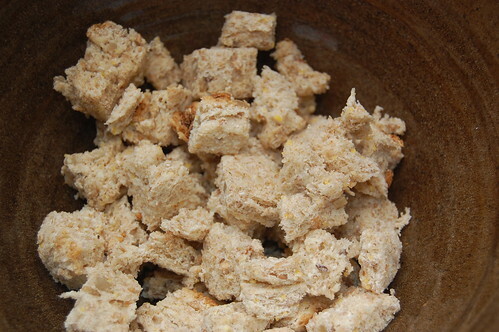 Melt the butter for the topping in a small saute pan and toss the bread crumbs to coat. Sprinkle over pasta and bake for 30 minutes. Let cool for a few minutes before serving. My New Favorite Way to Cook Shrimp! I’m still obsessed with my Anheuser-Busch Great Food Great Beer cook book. 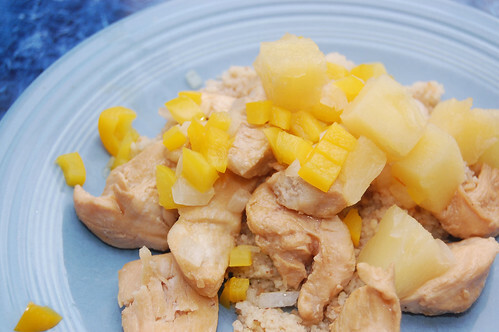 I know, it doesn’t look like much… but it really has great easy recipes that you can throw together on a weeknight (and isn’t that what you’re here for?). You don’t need to use a fancy beer, a bottle of Budweiser will do just fine. 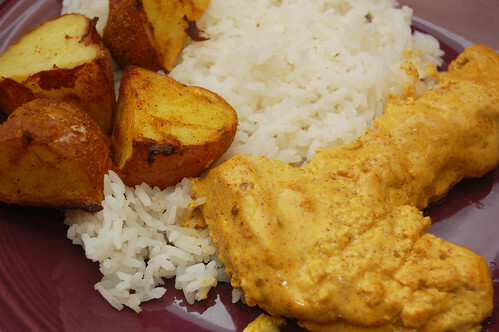 I adapted the recipe from the cook book a bit, adding a few extra spices to give it more depth of flavor. I also cooked the shrimp in a grill pan instead of a heavy skillet, but because you’re drowning the shrimp in beer it probably doesn’t make a difference. 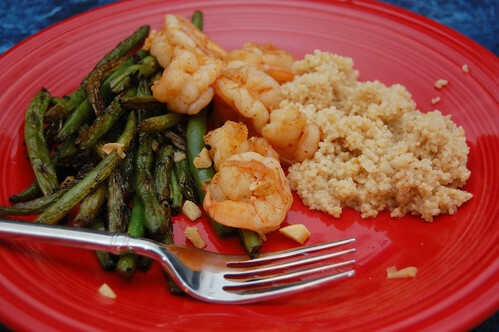 Morgan and I enjoyed this dinner over couscous and spicy Szechuan style green beans (spice-phobes beware!). 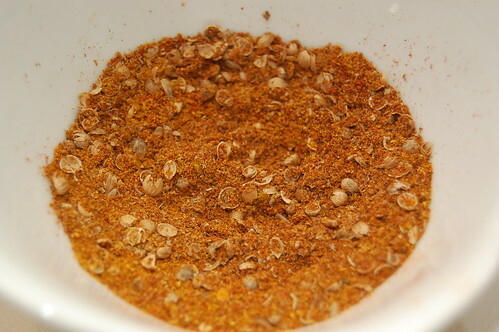 Measure and combine cayenne, cumin, chili powder, salt and pepper in a small ingredient bowl. Heat large skillet on medium high heat. Add a little bit of oil when hot. 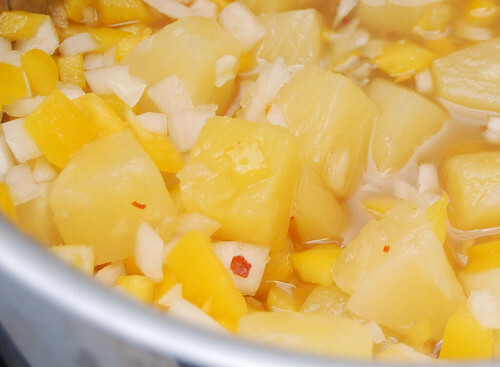 Add garlic and stir quickly so that garlic doesn’t burn. Add shrimp, followed by spice mixture, and stir. Immediately pour 1/2 bottle of beer into pan and cook for about 3 minutes. Turn the shrimp and add remaining 1/2 bottle of beer. Cook until shrimp are firm, pink and curled. Serve immediately. Heat medium size skillet on medium heat. 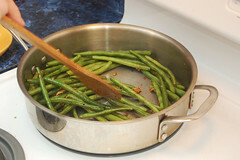 Add about 1 tablespoon of oil, followed by green beans. Stir, adding spice mixture and soy sauce. 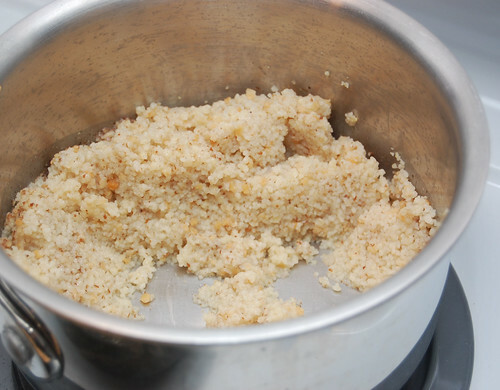 Cook until desired tenderness is reached (about 7-10 minutes). 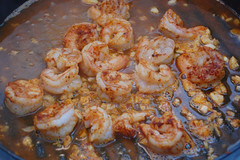 Comments Off on My New Favorite Way to Cook Shrimp! 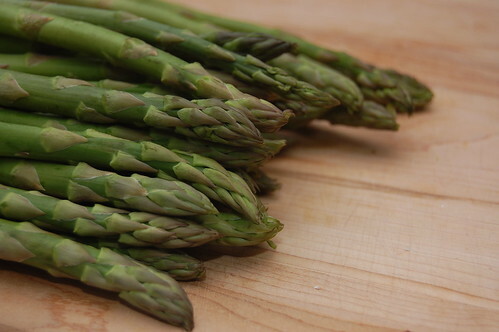 Several readers lately have asked Edwin or myself about how they can use what they have on hand – either learning new ways to use a specific ingredient that they happen to have an abundance of, or ways to improvise with what’s available. Tonight was a bit of an improvising night for me and my husband. We had a great time on Saturday morning at the Arlington Farmer’s Market, which means we brought home various produce that looked good but that we didn’t know what we’d use it for. Among these items were two small to medium sized Russet potatoes. I’d been eying a recipe for Potato Latkes lately; however when I started making them last night I quickly realized that I didn’t have Yukon potatoes or an onion (how could I not have an onion?). I decided instead of throwing in the towel that I’d, well, improvise! The result of my improvisation should not be referred to as latkes. To anyone who has had latkes or knows what they are, I’m sure I’m not fooling you! Latkes are typically a Jewish tradition, and it’s really just a simple potato pancake fried until crispy with some grated onion and an egg. Yeah… that’s not what I made! I located a red pepper in the fridge that was almost past its prime – in the “latkes” it went! 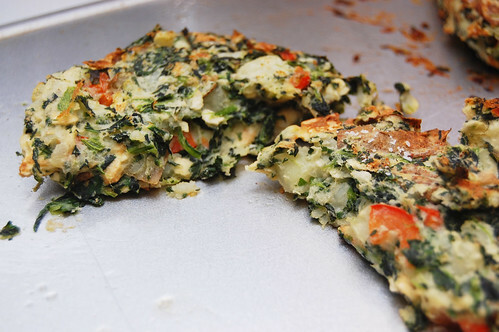 Joining the red pepper were my favorites – frozen spinach and a bit of garlic. And for my final insult, instead of using 6 tablespoons of olive oil and frying my little cakes, I axed the oil completely and simply broiled them! 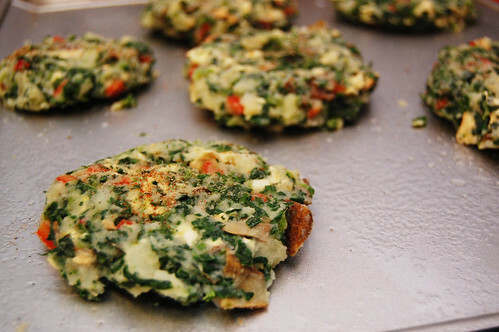 In the end I was left with potato cakes that were crispy on the outside, soft on the inside, brimming with healthy veggies and a nice kick of salt and pepper. My adventure was a success, and I was able to use some quality produce that we didn’t want to go to waste. There are really endless combinations that you can create! My husband and I ate these potato cakes on their own, but a side of baked beans would make a nice compliment. Enjoy! Steam cubed potatoes in a colander, covered, over boiling water until tender, approximately 10 minutes. Cool and mash. Cook spinach according to package instructions. Drain thoroughly and set aside to cool. In a medium bowl, combine mashed potatoes and diced red pepper. 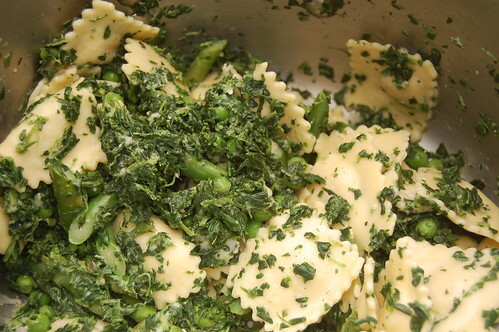 Add in spinach, garlic, egg, crushed matzah, 1/2 tsp of the salt and some black pepper. Spray a large cookie sheet with cooking spray. 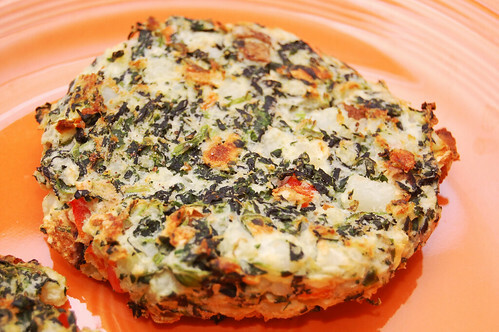 Form mixture into patties and place on the sheet. The mixture should stick together without sticking to you. 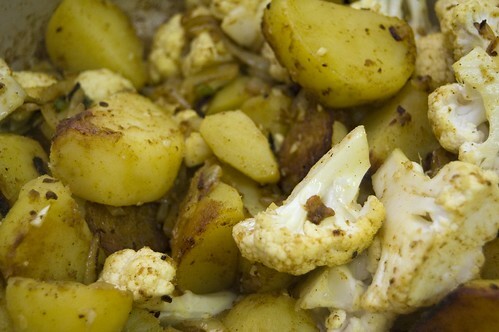 Sprinkle remaining salt over the potato cakes along with some more pepper and a dash of cayenne on each. Broil (remember to keep your oven door partially open) at the top of the oven for 9 minutes, then carefully turn patties over with a spatula (don’t burn yourself!) and broil for an additional 4 minutes. Serve, sprinkling with more salt and/or pepper as needed. So remember back when I said I had seen a great recipe for a layered tortilla pie, but then I lost it? Well a few weeks ago I found the recipe and wow it was good. 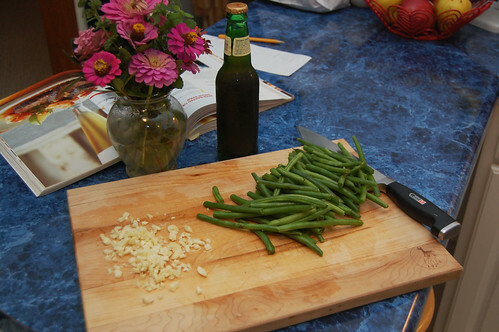 What really made it different and delicious was the way the black beans were cooked – soaked in beer! It occurred to me on Friday that this style of cooking beans would be amazing in a taco salad. I’d never actually made a taco salad before, and without the assistance of a giant taco shell to throw everything in I’m not sure how authentic it is, but I thoroughly enjoyed the final product. The husband loved it, I loved it, it got me to eat lettuce (even if it was only iceberg lettuce) and all was right with the world. This is also one of those meals that I think you could stretch to feed any amount of people. I’ll warn you that the two of us had a lot of leftover black beans, but I knew that going in to it and actually wanted leftovers to throw in tortilla shells and try other things. If you’re serving one or two people and you don’t want leftovers, just cut the black bean recipe in half. Of course, if you do this you’ll have to finish off half a can or bottle of beer on your own instead of using the whole can for the beans… hopefully this isn’t a problem for anyone. The chicken plays a relatively minor role here, and if you’re a vegetarian or just not that into meat I think you could leave it out and still have a great dinner (or very large lunch!). The black beans really make up the main flavor. You can definitely taste the beer that they’re soaked in, and I think it’s excellent. I’m actually tempted never to make black beans again unless they’re cooked in beer. You don’t even need to use a fancy one – we just used a can of Bud Light. It works; trust me! To make the black beans – Add onion, red pepper flakes, garlic, cumin, salt and pepper to a large skillet on medium for 5 minutes, stirring often. 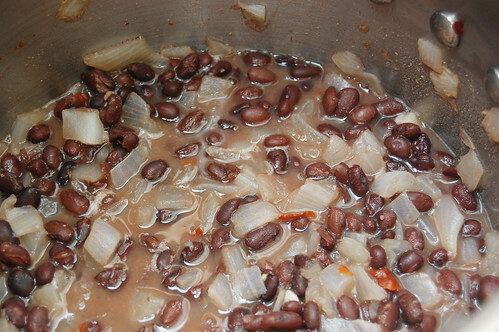 Add rinsed and drained black beans and beer to the skillet and bring to boil. When boiling, reduce to medium-low and simmer until most of the beer evaporates; approximately 15 minutes. Stir in corn and remove from heat. 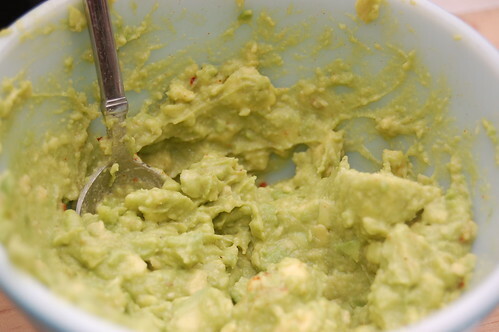 To make the guacamole – Peel and slice avocado and place in a medium size bowl. Add minced chili or red pepper flakes, sweetened lime juice, salt, minced garlic, black pepper and cayenne. Mash avocado with the back of a fork while combining ingredients. Don’t mash too much, you want it to be a little chunky. 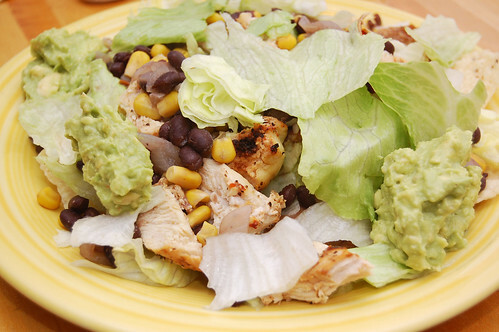 To put the taco salad together – Create a layer of tortilla chips on the the bottom of several dinner plates or one very large serving plate. Next smooth heated refried beans over the tortilla chips. 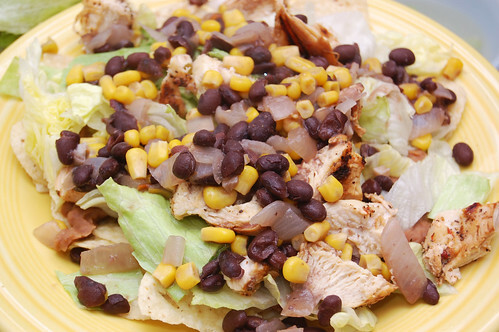 Add a layer of shredded lettuce, followed by the black bean mixture and chicken, then topped off with another layer of lettuce. Add dollops of guacamole to the sides of the plate or in separate bowls for serving. 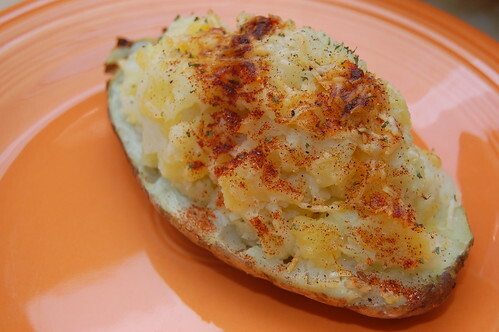 Twice baked potatoes are probably my favorite way to eat potatoes. I think I was first introduced to them by my father-in-law several years ago. 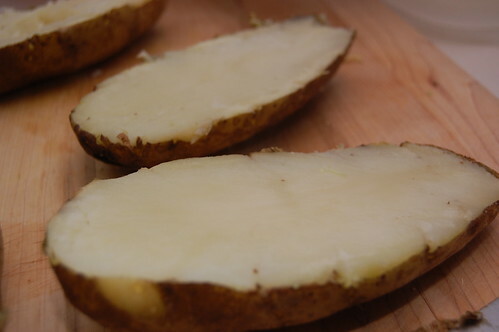 If you’ve never had them before, twice baked potatoes are made by cooking a Russet potato, cutting it in half longways, scooping out the insides and mixing them with delicious things, and then spooning it all back the potato and cooking them just a few minutes longer. Back in March I shared a recipe for mashed potatoes and rutabaga that several of you seemed interested in. I also enjoyed that one a lot, so I decided to work with rutabaga again – this time combining the mashed rutabaga into twice baked potatoes. I know rutabagas are mostly a winter vegetable; I guess I’m having trouble letting go? I think I may even miss rutabagas during the summer! Please keep in mind for this recipe that I tend not to load up my potatoes with hefty amounts of sour cream, butter and cheese, so if you think you might want more of something feel free to add it! To bake the potato, preheat oven to 400°F. 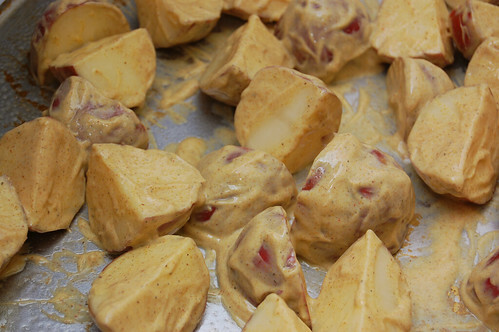 Wash potatoes and poke holes in each with a fork (to prevent exploding!). Lightly brush with a little bit of olive oil and place in the oven for about one hour, or until you can insert a fork into the potato without much pressure. Alternately, you can cook the potatoes in a microwave for about 10 minutes on high. Remember to still poke holes and brush with olive oil. 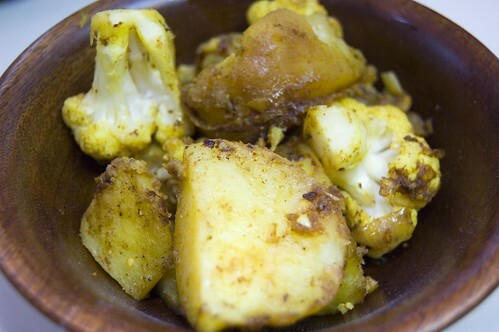 While the potatoes are cooking you can cook the rutabaga. Wash and peel the rutabaga and cut into one inch pieces. I’ve cooked rutabaga either by boiling for approximately 30 minutes (again until you can insert a fork into them without much pressure) or steaming them. Feel free to use whatever works best for you. 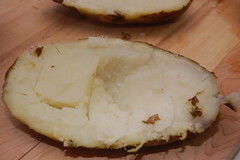 When Russet potatoes are done, slightly cool and then cut in half longways. Scoop out the inside and mash using a potato masher in a medium sized bowl. 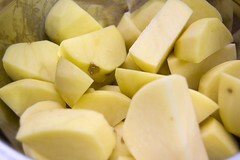 When rutabaga is cooked, add to the bowl and mash with the Russet potato. 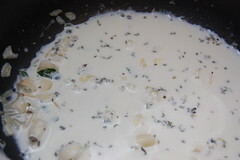 Stir in sour cream, milk, butter, cheese and salt and pepper. Mash and stir until you reach your desired consistency. 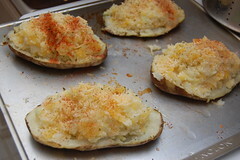 Spoon back into potato skins and return to the oven for an additional 10 minutes. 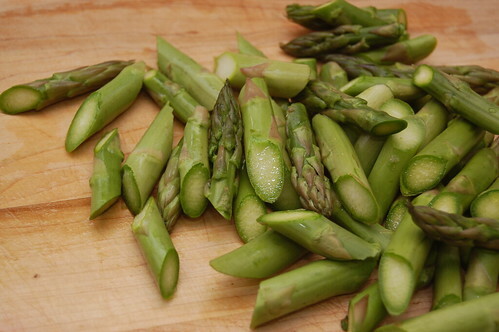 Garnish with paprika, chives and cheese. I was thinking about foods that I could make that might raise our energy level while being somewhat light and not weighing us down. I was also considering what to do with those hard-boiled eggs leftover from Easter. This also led me to remember something that my mom used to make on occasion when I was little. My mom called them “Soldiers,” but a quick googling of “Soldiers” plus “hard-boiled eggs” led me to an odd dish from the UK where buttered strips of toast are dipped into soft-boiled egg yolk. 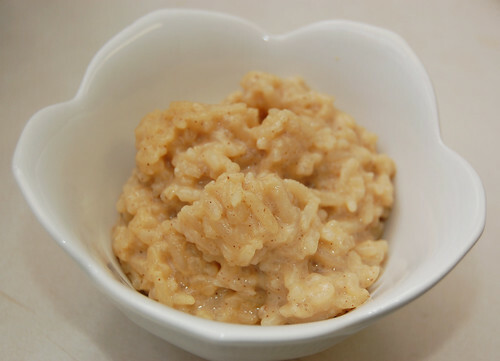 There actually are some similarities between what my mom refers to as Soldiers and the UK version – I wonder (and will have to ask) whether this recipe is something that was passed down and changed throughout generations like a game of telephone. In any event, this really hit the spot! Eggs are a great source of protein, especially if you don’t eat meat. As long as you enjoy eggs in moderation (like most things), you shouldn’t run into any issues with cholesterol. I’m not sure exactly how to describe the taste – it’s a very simple dish with the egg yolk and pepper being the two flavors that jump out most distinctly to me. As a kid I remember thinking it was just a really fun thing to eat. It’s definitely light and is great to enjoy either an hour before a workout or after. To hard boil the eggs – Place the three large eggs in a medium saucepan and add cold water until eggs are just completely covered. Set to high heat. When water with eggs starts to boil, remove the pan from heat and cover with a lid. Let the pan sit for about 12 minutes. 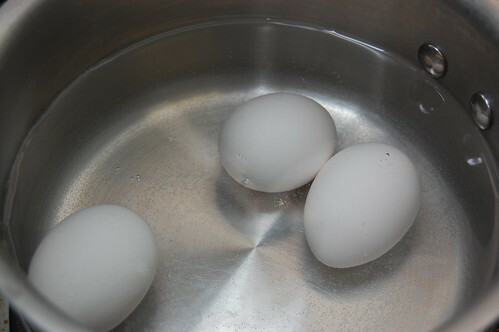 Run eggs under cold water to cool. 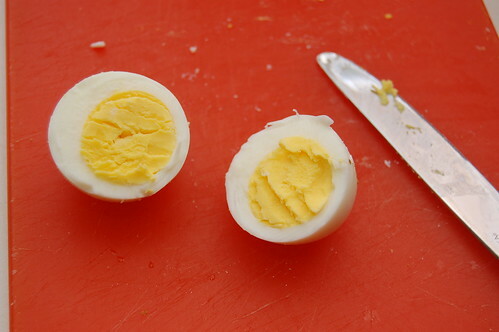 Cold hard-boiled eggs are easier to peel. To peel eggs, roll on a flat surface (like your kitchen counter) with the palm of your hand, pressing down gently. When the shell cracks it should be fairly easy to peel off. 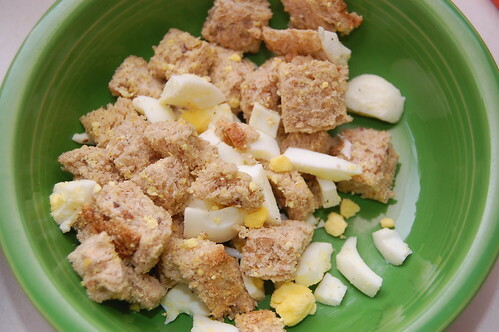 When eggs are peeled, cut into cubes. Stack slices of bread and trim off ends. Butter one side of each slice and cut bread into cubes. 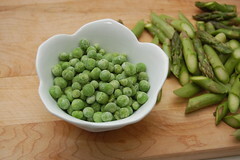 Add to a medium size bowl and then add egg pieces. Season generously with pepper and add a bit of salt. Toss to combine and serve.